Chanel: #ParisCosmopolite Bags, Bags, Bags! You read about Singapore’s first-ever Ephemeral Boutique for Chanel that recently opened its doors at Marina Bay Sands, you read part 1 of Chanel’s 9 special ateliers collectively known as Métiers d’Art. And you could be asking, what’s the link? Well, Chanel’s Métiers d’Art collection (that is devoted to celebrating these 9 ateliers) happens annually, and this year’s collection is themed #ParisCosmopolite and is partly inspired by Coco Chanel’s time at (and her special relationship with) the Ritz Paris, where she kept an apartment for many years. Now that you understand the link between Métiers d’Art and the #ParisCosmopolite pop-up boutique, I can now focus on what I enjoy the most about this collection: the bags. And the first one? This show-stopper of a stunner, the aged lambskin leather 2.55 that comes adorned with charms. Charms that each depict Coco’s time at the Ritz, from the telephone to the hotel key, along with love letters she would have received from her admirers to other Chanel icons like the camellia, the perfume bottle and the #5. Available in two sizes, the larger one measures 24 cm by 16.5 cm (SGD10,820) while the smaller one comes in 20 cm by 14.5 cm. Another beauty that’s an icon-in-the-making, the new season Gabrielle Hobo that all of you should be familiar with by now. Available in a variety of sizes, they now come in new colours as well, including this one in metallic gold calfskin that measures 28 cm by 21 cm and retails for SGD5700. You can get the smallest one as a weekend companion, or the largest one as an everyday work carryall, it’s really up to you. Also available in metallic silver, tweed, even in a combination of suede and polished calf, I promise you’ll be a kid in a candy store if your heart is set on one. From the practical to the novelty, here’s a fun full-leather clutch that’s inspired by the regal hotel room door at Ritz Paris, more specifically, Coco Chanel’s very own suite (that’s her room number) at the famed Parisian hotel. Measuring 20 cm by 15 cm by 6 cm, you can use it as a clutch, or simply take out its long metal chain sling from the inside and use it a lovely evening bag. A beautifully memorable keepsake that no hard-core fan of Chanel should be without, this little piece of Coco’s history can be yours for just SGD12,990. Another novelty piece that I adore is this one, simply known as the Pouch Bag that comes in black or gold sequins. Quite literally as flat as it looks, you could use it as an evening clutch, or hang it on your door. And depending on your mood, you could place it on the side that says Please Dare To Disturb, or flip it over to show Do Not Disturb. A unique conversational piece, this SGD7290 beauty is another collectible no fan should be without. And now that you’ve seen the 4 I adore the most, here are more bags from the rest of the #ParisCosmopolite collection that you should most definitely check out as well. From the elaborately detailed Boy Chanel and the seasonal Classic Flap pieces to even other novelties like the black/gold striped perfume bottle clutch and the flat 2D evening bag adorned with crystals, just leave a comment here if you would like to know about these pieces and I’ll get back to you guys stat. Gucci’s iconic Dionysus and GG Marmont bags get beautiful embroideries for the brand’s Pre-Fall 2017 Collection. The GG Marmont bags are seen in velvet material and comes with embroidered appliqués like the word LOVED, as well as, florals, dragonflies and feathers. The Dionysus bags are made available in various materials this season, which includes the signature GG Supreme, python, leather and crocodile. The hand-embroidered designs for the Dionysus includes Gothic Gucci, Angry Cat, floral and crab patterns. Louis Vuitton knows what side its bread is buttered on. The brand may make gorgeous full lines of ready-to-wear, outwear and shoes, but when it comes down to it, the make-or-break element of Vuitton's business is handbags and accessories, and nothing makes that clearer than the brand's seasonal ad campaigns. They're always chock full of yet-to-be-released bags, some of which also didn't appear on the runway, which means they're of particular interest to us. Vuitton released its Spring 2017 campaign recently, which has lots of clear, up-close photos of the season's new accessories, including the buzzed-about Etui iPhone Case. The ads also feature longtime brand ambassadors Michelle Williams and Jennifer Connelly, as well as a handful of LV's favorite models. Today’s Louis Vuitton show took place in the future home of the brand’s Place Vendôme flagship. Scheduled to open in 2017, the new store will combine two buildings, spanning the famous square and the Rue Saint-Honoré. Sitting on the boutique-to-be’s second floor this morning with those monumental views out the windows, there was no escaping the metaphor: As global as its reach is, Louis Vuitton is Paris. So it was fitting that creative director Nicolas Ghesquière brought his collection home metaphorically, as well. His Cruise offering, presented in Rio de Janeiro last May, was a tribute to that city’s sportif seaside culture—colorful, loaded with print, and beachily body-baring. The orientation of his bold new Louis Vuitton collection is different. While it retained some of the tropes of the previous season—the daring cut-outs in particular—the results were more glam. Call it hot bourgeois. “I realize that I didn’t explore that much yet the sophistication and the more dressed-up part of Louis Vuitton,” he said afterward. The sophistication he was speaking of comes down to the type of clothing he zeroed in on: tailoring, first and foremost. Ghesquière’s are not suits for office drones; with slices removed from the shoulders and capeleted open backs, they negotiated the territory between practicality and experimentation. As he settles in at Louis Vuitton (today’s venue seemed conceived at least in part to quash the ongoing rumors that he’s on his way out the door), Ghesquière is leaning more toward experimentation, if not the outright high-concept fashion of his earlier days. See the asymmetric draped jersey numbers with the hip and midriff cut-outs, some with 1980s-ish sprinkles of crystals and glitter; see also the series of long, sheer-yet-discreet dresses at the end. Among all the soigné stuff, there were sweatshirts, a logo tee or two, and skinny lace pants with matching pelmet skirts; they’ll be the kinds of things cosmopolitan fashion types will be seen in next season at the shows. The press notes mentioned a fact little known even among Parisians that, before the Place Vendôme was known by its current name, it was called Place des Conquêtes. As conquests go, this show had an indisputable one in the form of its Petite Malle phone cases. As the models walked by with them gripped in their hands, all the wannabe It bags we’ve seen over the last month of shows suddenly felt a little passé. Look around, a woman can make do without a purse, but not without her cellphone. 3 / 18 Tech accessories present a huge opportunity for luxury brands, but even though we're a zillion generations into the iPhone's existence by now, none of the top-tier players have every gotten phone cases and accouterment exactly right. Brands tend to approach the pieces too rigidly, which means that most of the fun, quirky cases that consumers love are made by upstarts instead of luxury leather houses. With one of the pieces heavily featured on Louis Vuitton's Spring 2017 runway, though, that might be about to change. There were a lot of exciting new bags in the show, including some very pretty full-leather pieces that should appease the logo-averse among us, but the thing I want to touch the most in person is the new iPhone case, modeled after the popular Petite Malle clutch. It looks as luxurious and detailed as any phone case I've ever seen, right down to the clochette that acts has an earbud-wrangler. The piece found its way into several models' hands, so I'm betting it (and hopefully a full line of equally luxe tech pieces) will be a big push for Vuitton come spring. Since 1952, Givenchy has been known as the fashion company with plenty of style and attitude. It’s modern design combines contemporary construction with feminine tone. There’s really no question why Givenchy has been noted as one of the most popular handbags companies in the world. Woman everywhere have dreamed of following in the footsteps of popular, classy, and famous ambassadors Audrey Hepburn, Elizabeth Taylor, and Jacqueline Kennedy-Onassis by getting there hands on one of these gorgeous bags. The Nightingale Bag comes with the modernistic appeal you’d expect from a Givenchy bag. With beautiful fine detailing across ravishing leather available in black, dark green, or rustic red, it’s simply the must-have bag for ritzy ladies looking to turn heads wherever they go. Pair it up with your finest apparel and switch it up from the leather, signature embossed top handles to the leather shoulder strap to match your style. Throw all your imperative items in the open interior and zip shut with ease. Modern. High style. Swank. There’s truly no other way to describe this iconic bag from Givenchy. Don’t dare call yourself a fashionista and have not heard of the Givenchy Antigona Bag. With the hottest celebrities like Fergie, Sofia Vergara, and Jennifer Connelly sporting this trendy tote, it’s a fashion staple and undoubtedly one of Givenchy’s most famous bags- and for good reason. The Givenchy Antigona combines a tremendous about of luxe style with attitude in a medium-sized leather bag complete with gorgeous cotton canvas lining. The trendy look can be easily paired with your favorite getup, available in 3 glorious colors of burgundy, beige and black. Busy women always on-the-go who need a swanky little bag to accompany you? Here’s your answer. 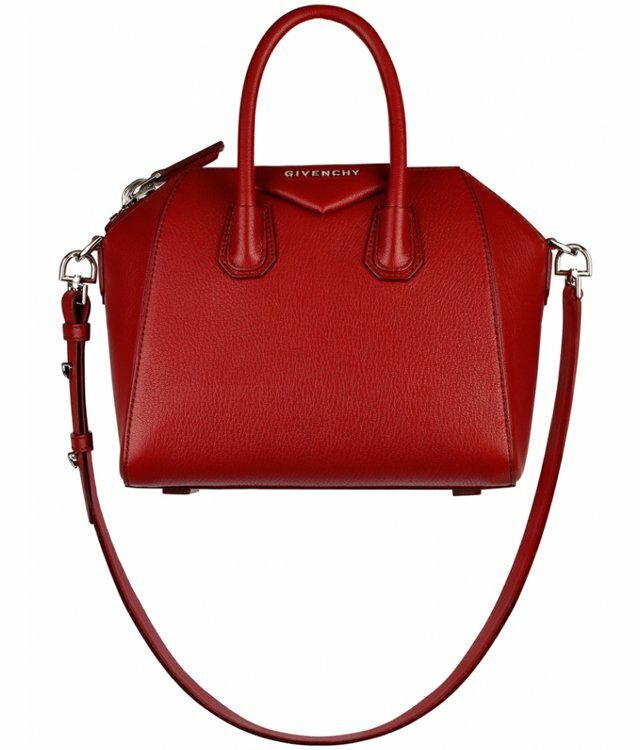 The Givenchy Pandora Bag is like Nightingale Bag’s little sister: all the chicness a woman craves in a compact design that can swing over the shoulder like a feather. Obviously this bag is ridiculously cute and stylish- but let’s just take a second to check out the accenting zipper along the front of the bag. How fashionable is that? Contempo surely didn’t skip pass this bag. Fancy and cute. The two best words to describe the House de Givenchy Tote Bag-otherwise known as HDG. Besides its obvious cozy interior with plenty of room, this oversized bag showcases a gorgeous leather exterior with accenting bottom-studs and silver hardware. The perfect bag for ladies with classy attitudes who need some extra wiggle room in there purse. Watch out. The Givenchy Obsedia Shoulder Bag brings along a whole new style that sets it (way) apart from the rest. And although small, this little bag is packing a whole lot of style and attitude. This upscale bag is designed with the finest leather, accented gorgeously with a cross and ring closure on the front, giving it a grunge look with a splash of gothic attitude. (Not to mention the chain link shoulder strap, which of course only adds to the extreme grungey style of the bag). 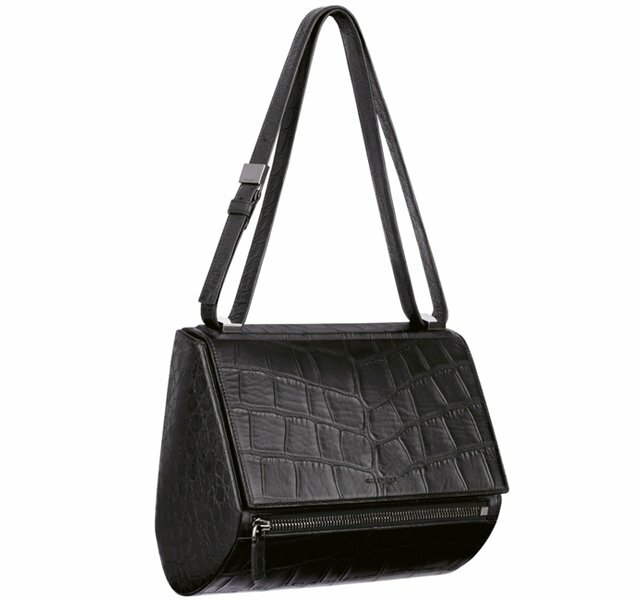 Ladies looking for a sassy bag to accompany their feisty attitudes will surely love this cool shoulder bag. Need a bag that you can literally take anywhere with ease? 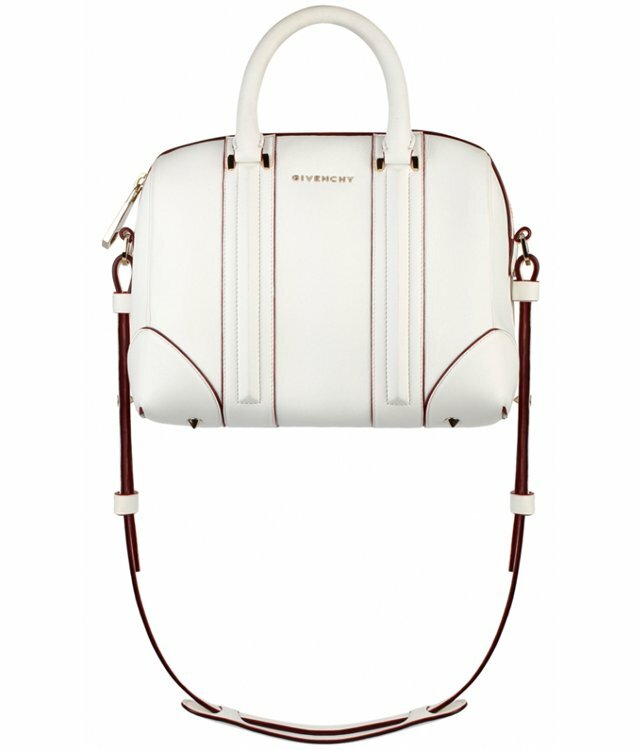 Then the Givenchy Lucrezia Bag is the bag for you. It’s got everything you need in one, medium-sized classy tote. Pair this bag up with your business suit and head to the office or bring it to the horse track paired up with your swankiest dress and hat. It’s versatility is just something we love. Simple yet stunning, this bag comes with plenty of detailing along the front and finishes with enticing stud details along the top and bottom. Fabric lined inside has plenty of room for all your must-haves and the zip closure ensures its safety. There’s just no guessing why this bag wouldn’t be your go-to for every occasion. More prices are available at request, drop your question in the comment section! 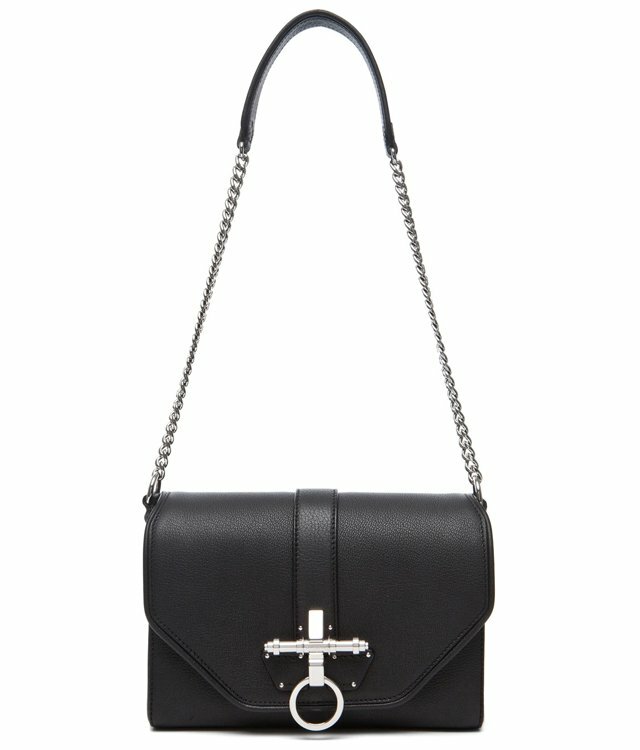 The Givenchy Antigona is one of those bags that continues to gain popularity at a point in its life cycle when any other bag would be starting to fizzle out as consumers move on to other things, and that’s how you know it’s one of the few truly exceptional pieces out there right now. That also makes it a perfect candidate for close examination in our newest Ultimate Bag Guide; below, check out all the info you need to decide which Antigona is right for you, including prices, size comparisons and side-by-side guides to currently available colors and leathers. The thing with fake bags online is that they are directly linked to the popularity of the authentic bags. This is why it’s so much easier to find the IT bags of the moment but it can be really complicated to find older styles. Celebrities have much to say in bag trends because they dictate what’s hot and what’s not in most of the cases. The same thing happened with the Mansur Gavriel bucket bag, for example. This bag because a huge success among celebrities and the rest followed. Now back to replica Dior bags. I think that most Dior bags are meant to look classic, even the new ones. They may not be the most original designer bags out there, but they always look timeless. I was really excited when I first saw the Dior Diorama bag. It looks so fresh and contemporary but without losing this classic appeal I am talking about. I know that many people accused Dior for lacking originality in their design once again, but I like it. So for those who are not into trendy bags but more into timeless, ladylike replica designer handbags Christian Dior might just be it. But it was about time to see something new from this brand. It’s not that I’m bored with the iconicLady Dior knockoff Dior handbags or the Miss Dior bag. But I feel they needed to make a new classic. And I think that the Diorama is it. Ok, so someone sent me some photos of a Dior Diorama silver metallic perforated flap bag, asking me if it was authentic. She found it on a site for £1,200. The price would not be bad for an authentic Diorama, but unfortunately this bag is a fake. You don’t see as many replica Dior bags on eBay and other sites as you see Celine or Givenchy bags, for example. But this is only because they’re not as sought after. So you still need to be careful. Replica Dior Dust Bag – Check The Dust Bag Too! I still love this bag even though it has flaws, but it’s just unbelievable how someone would sell replica Dior bags for this price. So maybe you were wondering how I realized this bag is a fake. Well, first of all I have to admit that I am not very familiar with the correct interior color of each Diorama bag (there are a lot of colors and variations). Still, I know for a fact that the interior of the metallic silver Diorama should be black. Also, the stamp should be printed, while the replica has an embossed stamp. And just in case you were wondering, the dust bag looks fake too. If you want to check the authenticity of a Dior Diorama bag, you should also know that the big chain links. They should also be engraved with “CD”. Check to see if there is a “Made In Italy” stamp in the interior right under the zipper. The Diorama replica Dior bags that are made of grained calfskin or smooth lambskin should also have a “Dior” stamp at the back of the bag, at the bottom. I think that the Medium size has black interior flap with silver stamp, while the Mini has grey leather on the interior of the flap, with black lining just in the interior compartment. But it wasn’t just the color of the interior and the stamp that gave this bag away. The Cannage Perforated pattern on the leather is also wrong. Just look at the two squares at the bottom of the flap. And now you can compare it with the original and see that it’s clearly different. So trust me, you can find replica Dior bags that are much better than this. And also cheaper, of course. There is no best Dior replica review on the blog because honestly, no one ever sent me great replica Dior bags reviews. And that’s really sad. But I really hope this is going to change soon and that I’m going to receive a Dior Diorama replica review soon! 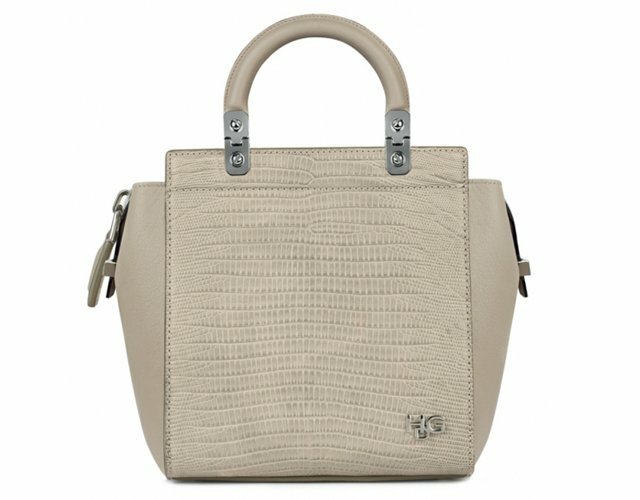 So what do you girls think of the Diorama replica Dior bags: love them or leave them? It's safe to say all of us here at PurseBlog are big fans of Gucci. Amanda and Megs frequently mention their favorites from the brand, and one of my favorite bags in my own collection is my Gucci Soho Shoulder Bag. And we're not the only ones; within the Gucci subforum, our PurseForum members are eager to show off there beautiful Gucci bags, both present and vintage, in the the What Lovely Gucci Are You Using Today thread. I can't take full credit for the decision to browse my way through the Gucci subforum. In the latestPurseForum roundup, our contributor Pattie showed us a gorgeous Gucci Soho Disco Bag, which really piqued my interest. Get ready to see stunning bags from Alessandro Michele's tenure at the helm of Gucci, as well as a wide selection of classic Bamboo top handles and functional Soho Disco Bags. Check out some of my favorite shots below and be sure to browse the entire thread--trust me, you don't want to miss any of the Gucci action!